North Manchester, IN -- Precision Medical Technologies, a contract manufacturer of orthopedic implants and instruments, announced plans today to expand its operations to Wabash County, creating up to 60 new jobs by 2022. "Indiana's reputation as the orthopedics capital of the world is made possible because of growing companies like Precision Medical Technologies," said Elaine Bedel, president of the Indiana Economic Development Corporation (IEDC). "By leveraging our sound fiscal policies and pro-growth business environment, Indiana delivers the resources and the people that companies need. We look forward to witnessing Precision Medical Technologies' success." The company, which already has facilities in Kosciusko and Noble counties, will invest nearly $5 million to expand its operations, purchasing and renovating a 9,000-square-foot manufacturing space at 400 Beckley St. in North Manchester. The site will house CNC machinery and related equipment to support the company’s new operations for disposable surgical instruments, and the company's current manufacturing implants and reusable instruments operations will continue at its existing sites in Warsaw and Rome City, Indiana. Fayetteville, AR — OurPharma, a start-up manufacturer of generic medications, announced it is locating a facility in Fayetteville to develop lower cost alternatives to generic drugs. The company plans to invest approximately $31.1 million in the Fayetteville facility where they will initially hire 10 to 12 new employees and expand to more than 100 employees within a seven-year period. Construction will begin this winter on the 14.9-acre site in the Fayetteville Commercial Park. Lockhart, TX -- Irby Construction Company, a premier transmission construction company based out of Richland, MS, has expanded to Lockhart, Texas, just 30-minutes southeast of downtown Austin. The new facility includes 14,000 square feet (SF), of which 4,000 SF is office space and 10,000 SF is warehouse. The Lockhart facility will begin with eight employees in the office who will be supporting over 200 employees in the Texas market. Due to the boom in energy infrastructure projects, Irby expects to continue hiring employees over the next 10 years to support expected growth. The leased facility is located at 1406 Blackjack Street, Lockhart, Texas, 78644. Idaho Falls, ID — The Idaho Department of Commerce has awarded an Idaho Global Entrepreneurial Mission (IGEM) Grant to the University of Idaho, Boise State University and their Center for Advanced Energy Studies, to partner with Sakae Casting - a Japan-based company that opened their first U.S. location in Eastern Idaho in April. IGEM Grants are awarded to state research universities to partner with industry leaders on research projects geared toward commercialization. The nearly $238,000 grant will help fund Sakae Casting’s research and development efforts by partnering with Idaho’s leading research universities to potentially change spent nuclear fuel storage and cooling capabilities at nearly 100 nuclear power sites. Twin Falls, ID -- Chobani, America’s #1 Greek yogurt brand and second largest U.S. yogurt manufacturer, announced the expansion of the world’s largest yogurt plant in Twin Falls, Idaho, breaking ground on a 70,000 square foot facility that will serve employees, guests and house Chobani’s Global Research and Development Center. New Orleans, LA — Last week, the World Trade Center of New Orleans celebrated Louisiana International Trade Week, a week-long event that included industry panel sessions and workshops. Presenting sponsors were the Port of South Louisiana and Associated Terminals. The week’s activities culminated last Friday evening, November 3, 2017, with the Louisiana International Trade Jubilee, a black-tie celebratory affair and fundraiser benefiting the World Trade Center of New Orleans. During the jubilee, the Port of South Louisiana’s Executive Director Paul Aucoin received this year’s Eugene J. Schreiber Award, established in memory of the late Eugene “Gene” Schreiber, which honors an individual who demonstrates exceptional knowledge and leadership in promoting international trade policy for the benefit of the State of Louisiana. Columbia, SC — Harbor Freight Tools, Dillon County's largest employer, announced a one million-square foot expansion of its East Coast distribution facility. This expansion is projected to create more than 500 new jobs, bringing the company's total investment in South Carolina to more than $200 million. Lubbock, TX -- The Lubbock Economic Development Alliance (LEDA) announced the creation of 66 new jobs and $66 million in capital investment at a press conference Wednesday morning. The additional jobs and investment come as a result of the expansion of two local businesses. X-FAB Texas, Inc. expanded its operations to include the production of silicon carbide power devices. Now, Lubbock is the first 6-inch silicon carbide foundry in the world. The company made a capital investment of more than $15 million to adapt its production to manufacture high-efficiency electrical power via Wide BandGap materials such as the silicon carbide wafers, and expects to spend as much as $50 million in capital investment over the next 10 years to increase capacity for Wide BandGap manufacturing. Columbia, SC — AHT Cooling Systems USA, Inc., a provider of custom refrigerated and frozen merchandising solutions, is expanding its existing Charleston County facility by adding assembly and distribution operations. The project will result in more than $5 million in capital investment and lead to the creation of more than 70 new jobs. With more than 30 years of experience, AHT Cooling Systems services the grocery and small format retail markets with manufacturing sites in Austria, China and Brazil. To establish its first production site in the U.S., the company is upfitting its Charleston County operations with a production business unit for the assembly of commercial refrigeration and freezing equipment. Reserve, LA — The Port of South Louisiana Executive Director Paul Aucoin and Airport Director Vincent Caire, along with members of the Board of Commissioners, commemorated the official opening of the first transient hangar (1) at Port of South Louisiana Executive Regional Airport, expanding services at the aero center in Reserve, Louisiana. Designed by NY Associates, Inc. and constructed by Justin J. Reeves, LLC, the 6,363 square-foot hangar has the capacity to accommodate a variety of large corporate and business aircraft, which are utilizing the Executive Regional Airport in Reserve on a more frequent basis. 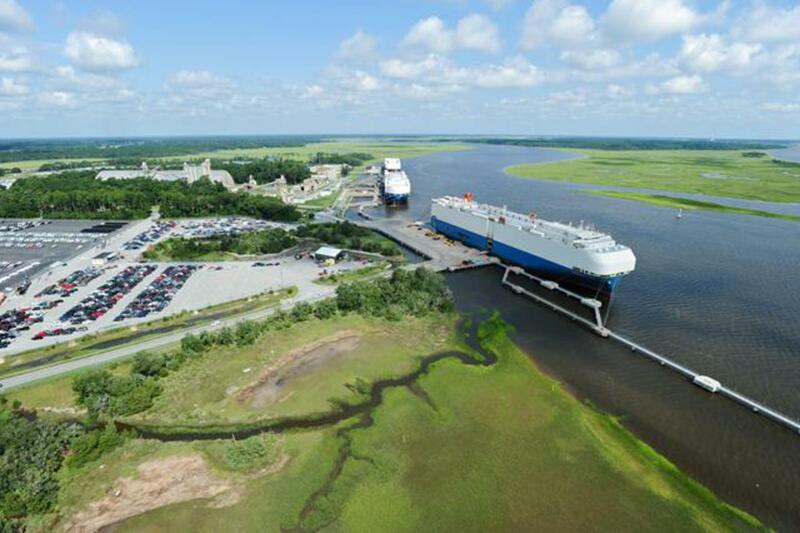 Charleston, SC — The South Carolina Ports Authority Board of Directors approved a $69.5 million contract for the purchase of six new ship-to-shore (STS) cranes to serve growing container volumes and big ships calling the Port of Charleston. "As the largest crane purchase in our history, the contract approved is an important part of our overall investment in infrastructure and capacity to ensure the Port is well-positioned for the future," said Jim Newsome, SCPA president and CEO. "When the cranes arrive in late 2019, deepening of the Charleston Harbor to 52 feet will be nearly two-thirds complete and construction of our new container terminal will also be nearly finished." Columbus, OH — Le Tote Inc., the fashion rental service that delivers unlimited clothing and accessories for a flat monthly fee, announced plans to open a distribution center in the Columbus Region, creating 400 new jobs. Hiring for positions in warehouse, quality control, receiving, inventory and laundry will begin in Q4 2017. The new 250,000-square-foot facility will be located in Obetz on 5465 Centerpoint Parkway. Le Tote will invest more than $1.1 million in training costs, machinery and equipment.